There is the perfect opportunity to settle some family scores this February half term as PLAY Expo heads to Blackpool on February 10 and 11 with some super challenges for lads and dads, mums and huns and champs and Gramps! Returning to the resort for a seventh year, PLAY Expo Blackpool is the UK’s longest-running retro games expo and offers a wealth of gaming entertainment for the whole family, whether you’re a pinball wizard, a SEGA superstar, or just a regular nostalgia-loving parent. It’s the perfect event at which to explore the very best challenges in the history of gaming, whilst also bridging the generation gap and bringing the family closer together. 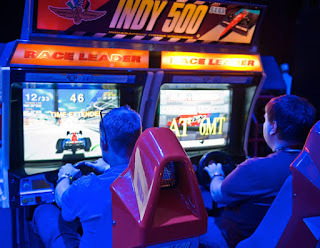 PLAY Expo Blackpool encourages healthy competition and provides the opportunity to steal some bragging rights over your nearest and dearest, across the wealth of gaming platforms on offer. There will be tournaments to participate in throughout the two-day event, held at The Norbreck Castle in Blackpool and family members are encouraged to go head-to-head throughout the weekend, to see who can achieve the greatest score, fastest lap, or a host of other things. There’s every opportunity for every family member to both win and lose at this extravaganza of gaming, which plays host to vintage classics, from Super Mario to Tomb Raider, as well as cutting-edge next-gen gaming, on PS4, Xbox One and Nintendo Switch platforms. There are also table-top board games for the whole family to enjoy, Cosplay masquerade and 100 free-to-play arcade games and pinball machines. All of this provides every reason for families and friends to head down and take each other on. There really is something to suit every generation. A weekend, two-day pass costs £28 for an adult, £16 for a child and £68 for a family, if bought in advance. A one-day advance ticket costs £16, £10 and £42 respectively. A special accommodation deal for ticket-holders has been created in conjunction with the Norbreck Castle Hotel which costs £25pppn, including breakfast, for a minimum stay of two nights, when quoting code REPLAY2018. Buying in advance allows early entry at 10am, rather than 11am, enabling ticket holders to quickly get on to their favourite consoles and machines. The event closes at 6pm both days.